Azad Garibov is a leading research fellow at the SAM Centre for Strategic Studies, Azerbaijan. The escalation brought increased international attention to the conflict resolution process. The subsequent meetings between the Azerbaijani and Armenian presidents in Vienna (16 May) and St. Petersburg (20 June) generated hopes for tangible progress in the peace process, deadlocked since the failure of the 2011 Kazan talks. The presidents agreed to de-escalate the situation along the line of contact, increase the number of OSCE observers working in the conflict zone, and re-launch the resolution process based on the Madrid Principles. However, the lack of progress since then and the increased ceasefire violations reveal that discussions of a real breakthrough are premature. In fact, immediately after the de-escalation, Armenia made efforts to accelerate the delivery of new deadly weaponry from Russia, based on a July 2015 $200 million military loan agreement, and delayed negotiations to gain the time needed both to rebuild confidence in the Sargsyan government and in the country’s military capabilities, as well as replenishing the manpower and military hardware losses following the April fighting. In July 2016, gunmen occupied a police station in Yerevan and held high-ranking police officers hostage in return for releasing Jirair Sefilian, an ardent critic of Sargsyan’s handling of the Nagorno-Karabakh conflict. This also played into the government’s hand, given its desire to delay making concrete commitments in the peace process. Yerevan effectively utilised the crises to block peace negotiations, citing public disapproval and resistance to resolution of the conflict based on the Madrid Principles. 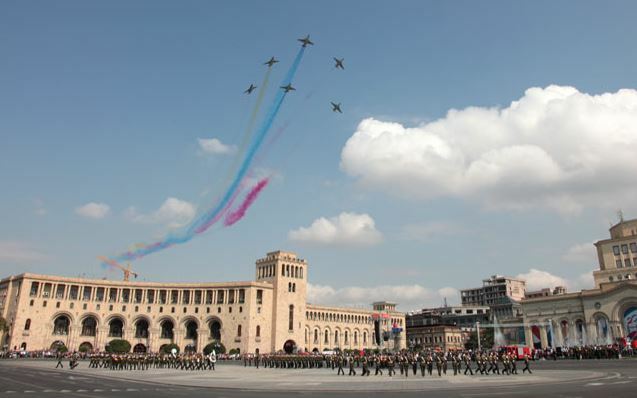 On 21 September 2016, Armenia held a military parade, the biggest in its history, showcasing several offensive military systems, tanks, as well as other sophisticated heavy equipment. Perhaps most notably, the parade featured the newly acquired Russian-made Iskander mobile short-range ballistic missile system. The parade also demonstrated the new Smerch multiple rocket launch system. But if parading the Iskanders was in part designed to frighten Baku, it achieved the opposite. Azerbaijan reacted quickly and harshly. Immediately, Azerbaijani Defence Minister Zakir Hasanov instructed the armed forces to increase their monitoring of Armenia’s strategic and military facilities and be ready to destroy them if necessary. In addition to this demonstration of military power, Armenia also held a number of military drills in the occupied regions of Azerbaijan at the end of September and throughout October. The drills included checking combat readiness of heavy artillery and hardware, and were held in the scorched lands of the occupied regions around Nagorno-Karabakh, particularly in the Aghdam and Tartar regions. Artillery strikes were clearly heard from nearby Azerbaijani villages located along the line of contact. One such drill involving artillery strikes even coincided with EU Special Representative for the South Caucasus Herbert Salber’s visit to Azerbaijan’s Barda region, which is very close to the line of contact. Despite Yerevan’s attempts to depict the drills as the work of local Armenian forces in Nagorno-Karabakh, it is obvious that there is not a separate Karabakhi army; all its components are integral parts of the armed forces of Armenia. For instance, when names of the first 56 Armenian soldiers killed during April escalation were officially revealed, it emerged that only 18 of them were from the Armenian community of occupied Nagorno-Karabakh. The rest were from different regions of Armenia. It is not the first time that military drills in the occupied Nagorno-Karabakh and adjacent regions of Azerbaijan have threatened peace and security in the region. In fact, during similar drills in the occupied territories in November 2014, two armed Mi-24 helicopter gunships flew over the Azerbaijani positions near Kangarli village in the Aghdam region. As it was seen from amateur video footage and later confirmed by the Azerbaijani Defence Ministry, soldiers – under apparent risk of being shot at – took down one of the helicopters using a MANPAD. That incident was provoked by drills near the line of contact, and escalated tensions, giving rise to harsh statements about retaliatory measures. It may be that military drills in the occupied territories and displays of newly acquired weaponry accompanied by harsh military rhetoric are addressed to domestic audiences and aimed at bolstering public confidence in Sargsyan; however, these moves clearly sabotage peace efforts and hamper the slim chances for negotiating a peace settlement. Not surprisingly throughout the last few months, we have witnessed an increase in ceasefire violations in Nagorno-Karabakh. This was particularly marked at the end of October, at the height of Armenian military drills in the occupied territories. 31 October, saw one of the fiercest ceasefire violations, involving large calibre mortars and machine guns. Thus, Armenia’s military muscle show-off threatens to shift the focus away from peace negotiations, and towards armament efforts in the region. In so doing, such measures do not contribute to the security of Armenia but rather jeopardise its national security via the increasing risk of renewed fighting around Nagorno-Karabakh. EuroActiv editors reject articles submitted by Armenians claiming they “can’t easily find” references to verify claims. Yet it is perfectly acceptable for EuroActiv to continuously publish anti-Armenian articles like this one — full of charges, innuendo, and with no references needed! Such an EuroActiv rejected article on the EU, OSCE negotiations and Nagorno-Karabakh was subsequently published on the DC-based International Affairs Forum’s site. Regarding this article’s theme of Armenian belligerence against settling the Nagorno-Karabakh conflict; one need only listen to the words of the ruler of Azerbaijan, Ilham Aliev, “Resolution of the conflict must be based on the territorial integrity of Azerbaijan, which is recognized by the whole world, he noted.” EuroActiv editors can “easily find” this quote in trend.az, Oct 26. Aliev is dictating there will be no negotiated solution to the conflict, period. Azerbaijan is demanding all or nothing. Azerbaijani sovereignty over the region of Nagorno-Karabakh will result in the immediate cleansing of the region’s population, which is all Armenian. Armenians have lived on those lands for over 2500 years and Azerbaijan wants those lands without Armenians. This has resulted in the current status quo. Self-determination in the EU is good enough for Kosovo, eventually Scotland and Catalonia, but not for Armenians. Last week Euractive published pro-Armenian article. You can find in Euroactive website. Nowadays nearly 30 thousands Armenians live in the jurisdiction of Azerbaijan safely. And Nagorno Karabakh Armenian will live safely in the jurisdiction of Azerbaijan in future. Of course Azerbaijan president notes usually that Nagorno Karabakh conflict must be resolved based on territorial integrity of Azerbaijan. May be this statement doesnt meet desire of Armenia rulers. But this statement demand of international law and system that was build after the second world war. When it comes Kosovo it is different issues. Because Yugoslavian constitution gave the independence right to Kosovo. But USSR constitution didnt give right of independence to Karabakh. Secondly I can suggest many cases that prove Nagorno Karabagh as a territorial part of Azerbaijan. One of them on June 16, 2015 Grand Chamber of the European Court of Human Rights passed two judgments on the reciprocal cases Chiragov and Others v. Armenia and Sargsyan v. Azerbaijan. Both judgments prove that Nagorno Karabakh Azerbaijan territory. A sustainable solution this bloody conflict between Armenia and Azerbaijan can only be found within the framework of international law which requires implementation of 4 UN Security Council resolutions on withdrawal of all occupying Armenian forces from Nagorno-Karabakh and surrounding regions, and comprehensive autonomy for Armenian and Azerbaijani communities living together in Nagorno-Karabakh within the territorial integrity of Azerbaijan. I can’t believe any European organization, news or government would take the side of Azerbaijan. It doesn’t matter who’s latest move is provoking who or is right or wrong. It is all politics and propaganda on both sides. The only thing that matters is whether or not the Armenians have a right to self determination…well..they do…so back of Azerbaijan, you don’t have a right to lord over Armenians just because Stalin said you could or you have a Islamic book that says you that you should conquer christian lands. Nagorno-Karabakh is inhabited by Armenians it should be run by Armenia, in fact there probably should go some more territory to the Armenians to connect Nagorno-Karabakh and Armenia.